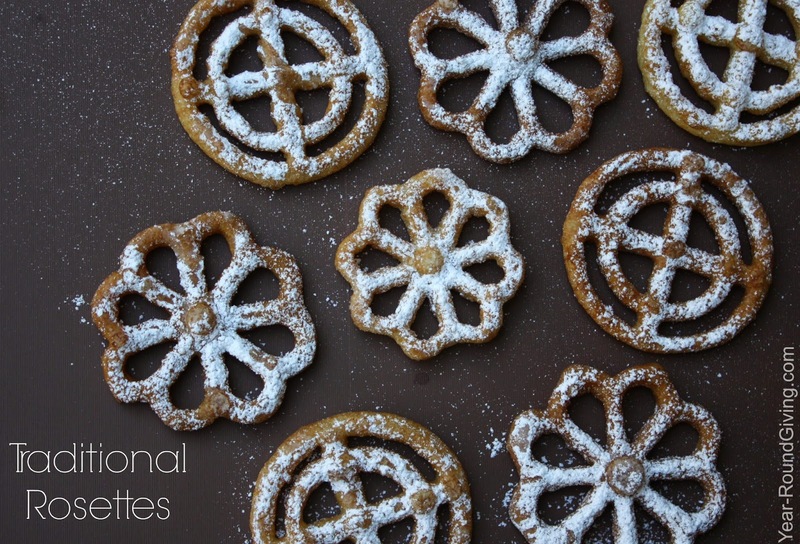 Traditional Rosettes are fun to make and taste like a funnel cake but lighter. Making Rosettes takes a little practice. I recommend having an assistant until you master the technique. I was half way through the batter before I felt like I could handle the process on my own. Don't let that scare you off. A little practice and you will be a pro. Fill a medium sauce pan 1/3 full with vegetable oil. Heat oil to 365F. Mix milk, vanilla, and egg together and set aside. In a large mixing bowl mix flour, sugar, and salt. Make a well in the middle of the flour mixture and slowly stir in liquid mixture until batter is smooth. 1. Select your Rosette iron and dip in the hot oil for 10 seconds. Shake off any excess oil. 2. Dip the rosette iron into the batter. DO NOT let the batter rise above the top of the iron. 3. Dip the iron into the hot oil for 4 seconds. This allows the batter to take shape. 4. Then with a slow pumping action lift the iron in and out of the oil. 5. The fried batter should separate from the iron. *See notes if batter doesn't separate from the iron. 6. Let the rosette fry for a few seconds and brown then turn it over to brown the other side. I used a wooden skewer to turn over and remove the rosette from the oil. 7. Lift out of the oil onto a cooling rack. 8. 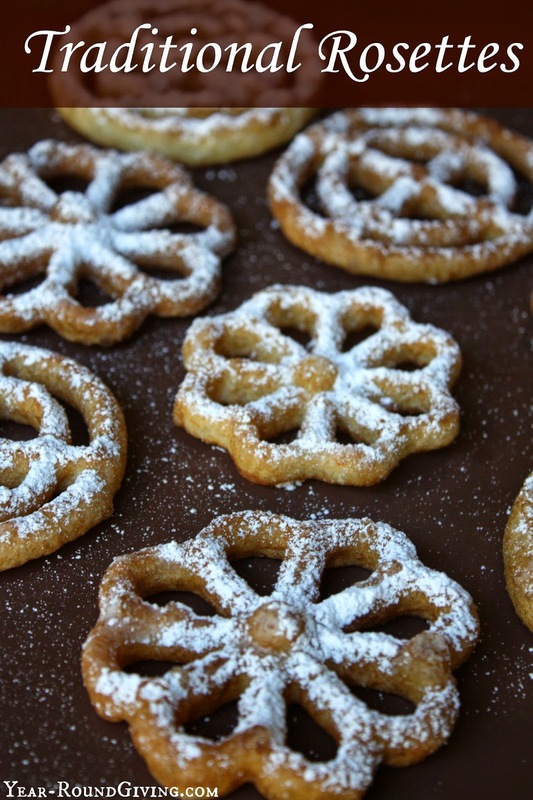 Sprinkle with powdered sugar when cooled. If the fried batter does not separate from the iron keep dunking the iron until batter is browned. Over a drying rack use a skewer or butter knife to gently separate the Rosette from the iron. When I got down to about 1/2 cup of batter left in my mixing bowl I felt the batter had gotten too oily and discarded the remaining batter. Don't forget to do Step 1 between every Rosette. Halfway through my iron got too hot and was cooking the batter before I could get it into the oil. If this happens use a spoon to scope out cooked batter and discard. Let iron cool down for about 20 seconds before dipping it in the batter. Use a cooling rack. If you place them on a paper towel they will get soggy.